This summer I was invited by Danny McCarthy to compose a piece to celebrate Beckett's centenary, for a CD of 100 one minute pieces, produced by Art Trail, who are based in Shandon, Cork City. On Beckett's taking leave of Ireland he made a final call to Cork, to Shandon, to visit the grave of Francis Sylvester O'Mahoney, aka Fr Prout, a writer he greatly admired. This compilation, "Bend It Like Beckett" is now available from Arttrail and Aphasia. Fergus Kelly: Ebb (2006) 58"
There are various starting points, interactions and associations for this piece. 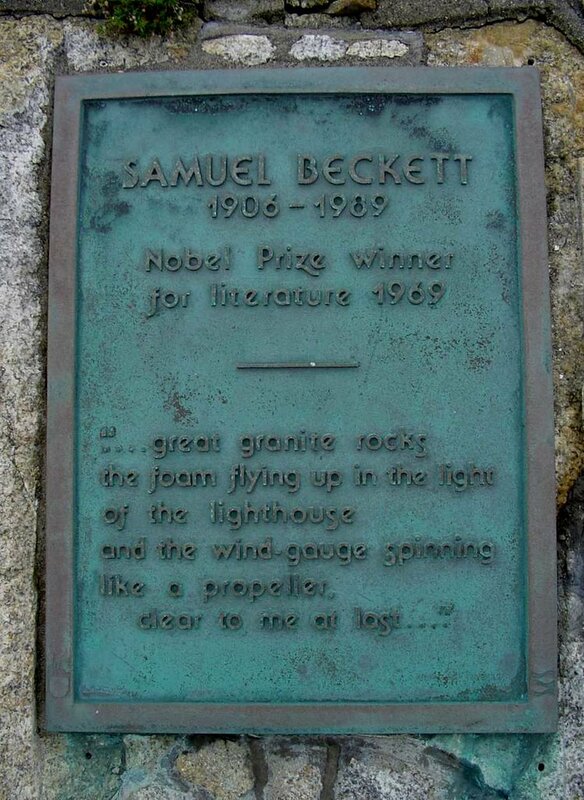 My first starting point was the use of Dun Laoghaire pier as a location that had resonance for Beckett, famously referred to in Krapp's Last Tape as his site of epiphany, when it was "clear to me at last" what he had been searching so long for as the subject of his work. Though the actual truth of this revelation is rather more prosaic, as it occurred in his mother's seaside house in Greystones. The pier is a significant site for me too as I grew up nearby and it was a favourite haunt. God knows how many miles I clocked walking its stretch over the years. I loved the sound of the foghorn, how it could be heard from afar, defining a particular sense of the landscape with its long melancholy drone, like some large beast exhaling. This particular foghorn was replaced by a far less interesting one years ago, but, thankfully I managed to get a recording of the old one in 1986. A fragment of this recording briefly appears, low in the mix, about three quarters of the way through. The main sound that occurs throughout is a gong sound made from a sample of a saw blade which as been pitch-shifted. Beckett was a keen music lover, and his sole musical foray was in 1966, when Claddagh Records made a recording of Jack McGowran reading from Beckett's work, with musical accompaniment by John and Edward Beckett. 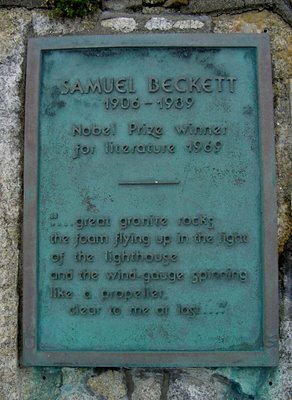 Beckett himself played gong to mark the division between passages. Morton Feldman was in the back of my mind whilst assembling this piece. Feldman was a great admirer of Beckett, and wrote an orchestral work, For Samuel Beckett, and dedicated his String Quartet II to Beckett. He managed to get Beckett to write a libretto for his opera, Neither (both of them disliked opera). There are parallels between Beckett and Feldman, as they both worked with extremely simple ideas which were constantly being whittled down to simpler and more elegant forms over the years. The silence between words and sounds were of equal parity to both. Hence the use of silence as an active element in this composition - breathing spaces for the decay of the sounds. Beckett's phrasing and timing was always very musical. Feldman also scored parts of his work to be played very quietly. Hence the low volume of this piece. The third sound is made with a prepared bass, used simply because it worked, no other conceptual agenda. The title relates to the natural phenomena of sea movement and sound decay. It was also the original title for Beckett's radio play, Embers.